1) The bass part is performed on synthesizer. This is no big deal today because it's done all the time, but The Bee Gees (along with Stevie Wonder) were one of the first artists to use it on record and prove that it could work. 2) The band is really, really tight. "Nights On Broadway" was recorded way before sequencers, yet when you listen to the tracks everything is performed extremely precisely, especially for the era. 3) There's not much in the way of sweetening on this track, since it's composed of drums, synth bass, guitar and piano. The only overdub is an ARP String Ensemble, which was the first string simulator in widespread use. A pop filter in front of a vocal or dialog mic can help keep the plosives (the big puffs of air from the "p's" in a word) in check and stop breath moisture from reaching the microphone's capsule. Here's a great video on how you can build your own that works every bit as well as a store-bought one. Audio mixing is one of the most interesting of all operations when completing a recording. For the rare few it's purely intuitive and comes out great without much thought, but for most everyone else, it's an operation in which you only get better by comparison and repetition. Many musicians and beginning engineers will often flail on a mix, trying everything with wild abandon and no focus, or not trying anything at all. It really helps if you have a process and this excerpt from the latest 3rd edition of The Mixing Engineer's Handbook provides just that. "Mixing is a nebulous art in that most musicians and engineers learn more by feel and listening than being taught. As a result, a number of important items in a mix can be easily overlooked, and these can mean the difference between a mix that sounds polished and professional and one that sounds amateurish. Here's a checklist of items that can help you think in a little more detail about your mix and tighten it up as a result. 1. Does your mix have dynamic contrast? Does it build as the song goes along? Are different instruments, sounds or lines added or muted in different sections? 2. Does your mix have a focal point? Is the mix centered around the instrument or vocal that’s the most important? 3. Does your mix sound noisy? Have you eliminated any count-offs, guitar amp noises, bad edits, and breaths that stand out? Each one may not seem like much, but their effect is cumulative. 4. Does your mix lack clarity or punch? Can you distinguish every instrument? Does the rhythm section sound great by itself? Is the balance between bass, kick and snare correct? 5. Does your mix sound distant? Try decreasing the level of the reverb and effects, starting first with the wettest, then working your way to the least wet. 6. Can your hear ever lyric? Every word must be heard. Tweak the automation if you’re using it; automate the track if you’re not. 7. Can your hear every note being played? If solos or signature lines are being masked, automate the track to hear every note, or tweak the automation until you can. 8. Are the sounds dull or uninteresting? Are generic synth patches or predictable guitar or keyboard sounds being used? Try modifying them with an effect. 9. Does the song groove? Does it feel as good as your favorite song? Is the instrument or instruments that supplies the groove loud enough? 10. What’s the direction of the song? Should it be close and intimate or big and loud? if your current direction isn’t working, try the opposite. 11. Are you compressing too much? Does the mix feel squashed? Is it fatiguing to listen to? Is all the life gone? Decrease the mix buss compression first. Decrease the main instrument or vocal compression next. Decrease the rhythm section compression next. Decrease the compression on everything else lastly. 12. Are you EQing too much? Is it too bright or too big? Decrease the upper midrange EQ on the vocals, guitars, loops and snare. Decrease the low frequency EQ on the bass and kick. 13. Are your fades too tight? Does the beginning or ending of the song sound clipped? Adjust the fades until the attack transient of the notes are distinct. 14. Did you do alternate mixes? Did you do at least an instrumental-only mix? 15. Did you document the keeper mixes? Are all files properly named? Are you sure which file is the master? Have you made a backup? An interesting mix is all in the details and those take time to sort out. Working through each one of these steps may take a while, but the end result can definitely be worth it." 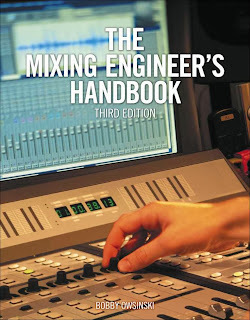 You can read more excerpts from The Mixing Engineer's Handbook and other books on the excerpts section of bobbyowsinski.com. As anyone who's into audio knows, Manley Labs tube audio gear is some of the finest in the business. But if you don't know already, CEO EveAnna Manley is one of the most unique individuals not only in the industry, but in any business. She's built Manley Labs into the powerhouse that it is by herself, based on superior designs and treating customers and non-customers extremely well. In fact, EveAnna has quietly helped more people in more ways that most people know (including your truly a few times). The lady has a huge heart and she has the smarts to match in that she knows more about tubes and the electronics that surround them than most people on the planet. If you really want to be impressed though, check out this video tour of the Manley factory. I got the tour a few years ago and was blown away. It's better now, as you'll see. Many musicians and engineers take the lowly direct box for granted and settle for the cheapest one they can find. That can work okay on some instruments, but if you really need some real low end, you have to spring for something more expensive. For years now Radial Engineering has been the king of the direct box hill with their fabulous JDI, and now they have something for the people who want the warmth of a tube with their new Firefly tube direct box. The Firefly differs from other direct boxes (tube or passive) in that it has two inputs, each with it's own gain control. These can be selected from a footswitch so you can have two separate setups for a guitar and bass, for example. There's also a variable high pass filter, and unique parameter called Drag that's basically a load corrector so the "feel" of the DI is more like a tube amplifier. The Radial Firefly retails for $599.